Every element of Fitness by the Sea was designed to create a fun and nurturing environment for every child ages 4 to 14. From our carefully selected staff to our safe and beautiful locations and state of the art equipment, we offer campers an unmatched day camp experience. We call it Growth, Caring, & Endless Fun! At Fitness By The Sea, we offer incredible growth opportunities hidden in fun, creative, and exciting activities. We treat our staff and your kids like members of the family. We want your child to develop deep friendships with other kids and find positive, encouraging role models in our staff members. 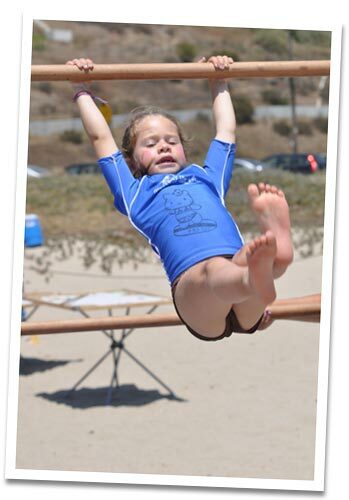 Many parents report that their children make friendships at Fitness By The Sea that last for years. We give campers the freedom to choose their own activities. Everything we do at FBS serves a purpose and offering campers the opportunity to choose their own activities is no different. A recent study by the American Camp Association revealed that kids need more opportunities to practice leadership and decision-making. That’s why we offer a variety of activities and let the kids decide what they want to do each day. Because we want your kids to develop more self-confidence and leadership ability. We believe that children learn by modeling the behavior of mentors, that’s why staff members actively participate in all activities, instead of simply serving as a referee or watching from the sidelines. We constantly encourage kids to get involved and have multiple staff members whose sole duty is to keep an eye out for kids who are sitting on the sidelines and bring them into activities. These staff members are teachers and parents that are specifically trained to tap into each individual child’s interests to help them select activities. We believe that active kids are happy kids. Many children who come to FBS don’t have any interest in sports, cheerleading, dance, or any of our other “active” programs … and that’s okay. Instead of forcing children to participate in activities that they don’t enjoy, we encourage them to explore new things they’ve never tried. In many cases, we’ve discovered the kids who aren’t very “active,” just haven’t found the activities they really love. We don’t allow teasing or bullying of any kind. Staff members are trained to quickly intervene and resolve conflict in the camp, modeling this to campers and teaching them to how to treat one another with kindness and respect. We believe that every child should be shown unconditional love and acceptance as they explore, learn, and grow. Many kids come to FBS with pre-existing labels from their peers in school like jock, brainiac, or nerd. We actively work with children to develop a positive self-image by nudging them out of their comfort zone and participating in unfamiliar activities. We believe that fun and personal growth go hand in hand. develop interdependence, confidence, and sportsmanship. foster creativity, imagination, and self expression. promote an active lifestyle, self-esteem, and perseverance. cultivates self discipline, determination, and courage. opens the mind to endless possibilities and interests. We encourage children to “learn by doing” and our staff members are there to serve as mentors and participants during these activities.